I can't recall ever ordering paella in a restaurant, and I know I have never made it at home before, but I have always known I would love it. I love shrimp and chorizo and the beautiful color that the saffron turns everything. This was a really simple version I threw together quickly for a weeknight dinner so it is by no means traditional, but it was delicious just the same. This serves two for a light dinner, but if you're starving, one could probably finish it off. Add the cooked rice (I used Jasmine because it's what I had on hand) to the paella pan or any other wide shallow pan you have and start to simmer with the stock and saffron over medium heat. Once the mixture is warmed through (after about 8 minutes) add the peas and chorizo and warm through. As soon as you start to see a bit of a crust forming on the bottom of the pan, you know you're getting close to chorizo deliciousness and that it's time to add the shrimp. Add the shrimp and cook until just turning pink (nothing worse than overcooked, hard shrimp). Divide between two bowls and enjoy! 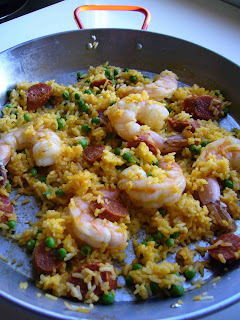 Mm i love paella, this looks delicious. Great light meal, perfect for summer time!